Is Barnes and Noble Still the World's Biggest Bookstore? Barnes and Noble: Is It Still the World's Largest Bookstore? Changes in the "World's Largest Bookstore" designation reveal a dramatic shift in book retailing trends. Independent retail bookselling is beating the biggest retail bookstore chains, and the Internet is beating brick-and-mortar bookstores in some very important industry-disrupting ways. So What Is the World's Largest Bookstore? Depending on how you measure it, several bookstores can claim some right to the title of "World's Largest Book Store." Large can be measured by store size, retail sales floor square footage, number of titles, shelf space, and even more measurements. A frequently asked question from retail industry analysts, experts, investors, professionals, and enthusiasts is “Which book store is the largest in the world and where is it located? The answer is...it depends. Is It Barnes & Noble? The Barnes & Noble College flagship store. A large selection of used academic, medical, and law textbooks. An in-store coffee shop serving Starbucks coffee on the second floor. But even while the Barnes & Noble flagship store was claiming the "World's Largest" title, another bookstore was also advertising itself as the world’s largest bookstore. Considering the non-book type of merchandise and offerings made by the Fifth Avenue Barnes & Noble, this second claim was at least somewhat plausible. When measured by the number of book titles offered for sale, the World’s Biggest Bookstore located at 20 Edwards Street in Toronto was legitimately the world's biggest. But then this store also closed in 2014 shortly after the Barnes & Noble flagship store closed. This has been an unsupported claim, but it is also an undisputed claim so apparently, there are no other independent bookstores that think they are big enough to force the issue. With 68,000 square feet and 1.6 acres of retail sales floor, Powell's City of Books, located at 1005 West Burnside Street in Portland, reportedly has over 1 million books on its shelves and it purchases 3,000 used books each day. Although the Guinness Book of World Records no longer has an official listing for the "world's largest bookstore," Powell's can validly lay claim to the title in every way that "largest" has been measured in the past. 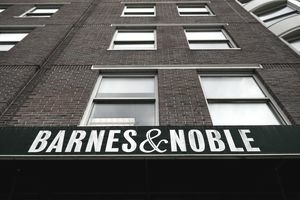 The largest store in the Barnes & Noble chain is now reportedly its Union Square store in New York, which is smaller than Powell's, measuring just 62,000 square feet. There is one more legitimate "world's largest" title claim when it comes to books and retailing — the "World's Largest Books Retailer," which isn't really a "bookstore" at all. It's estimated that Amazon has 3.4 million books on its virtual shelves at any given time, which is more than three times the number of titles claimed by Powell's. It's also estimated that a new book title is added to Amazon's cyber bookshelves every five minutes. Moving even farther away from traditional brick-and-mortar retailing, Amazon can stake a claim to being the "World's Largest Bookseller" in another respect. It's the world's largest retail seller of digital ebooks. An estimated 74 percent of all ebooks purchased in the U.S. were purchased from Amazon.com in 2015, and 71 percent of all U.S. dollars spent on ebooks were spent on Amazon.com. Amazon's Kindle gets most of the credit for its dominance in retail ebook sales. Sixty-five percent of all ebook sales published by traditional publishers were purchased through the Amazon Kindle store in 2015. Amazon's only real competitors are the Apple iBooks store, the Barnes & Noble Nook store, the Kobo Book store, and Google Play. Despite its complete dominance of internet e-commerce book sales and digital ebooks, Amazon's customer-centric founder Jeff Bezos hasn't been content with its non-physical success in book retailing. The grand opening of the first Amazon physical bookstore took place at the company's headquarters located in Seattle, Washington in 2015. If the endeavor proves to be successful over the long haul, it's conceivable that Amazon will also lay claim to the title of "World's Largest U.S. Retail Bookstore Chain." Barnes & Noble: 633 retail book stores in 50 states. Books-A-Million: 260 retail book stores in 32 states. Half Price Books: 127 stores in 18 states. Does Apple Use Discounts, Deals or Promotions to Sell Apple Products?